Winter's Passage Never make a promise to a faery. They always come to collect. Now Meghan Chase must fulfill her promise to Prince Ash of the Winter Court and embark upon a dangerous journey into the heart of enemy territory—while being pursued by a relentless new foe and guarding her own foolish heart. Summer's Crossing What can turn enemies into reluctant allies? A call from the Exile Queen, Leanansidhe, ties legendary prankster Puck to his archenemy, Prince Ash, on a journey that may end in betrayal and will set them both on an irreversible path. Iron's Prophecy Before she ever knew what she might become, Iron Queen Meghan Chase was warned by the oracle that her firstborn child would bring nothing but grief. And even as Meghan and Ash celebrate their long-awaited union, the prophecy stirs. I don't want to go into too many details- mainly because this book is stuffed full of spoilers. Iron Legends is a collection of three novellas as well as other surprises and fun reads like a guide of how to survive in Faery! 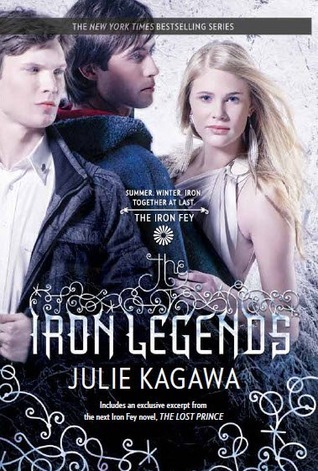 This is such a fun read to hold you over for the new series about the Iron Fey, starting with The Lost Prince. I would highly recommend reading this book if you are a fan of the series, or you are planning on reading the Lost Prince. The third short story, Iron's Prophecy reveals some incredibly (and spoilery) information about this new series, things that most of the characters themselves don't even know. I am so happy all of these stories are in book form now! I love the cover, love the novellas and can't wait to read more about this world that the author has created! I first have to get the first books read. I know, I know. I'm so far behind. lol!!! Thanks for mentioning this as i hadn't realized the author had this out.